Kids And Pet Turtles Don't Mix : Shots - Health News Stay away from tiny turtles to keep salmonella at bay. The appeal of those little pet turtles escaped us, even before we first heard about their role as carriers of disease. Give us a dirty rat any day. 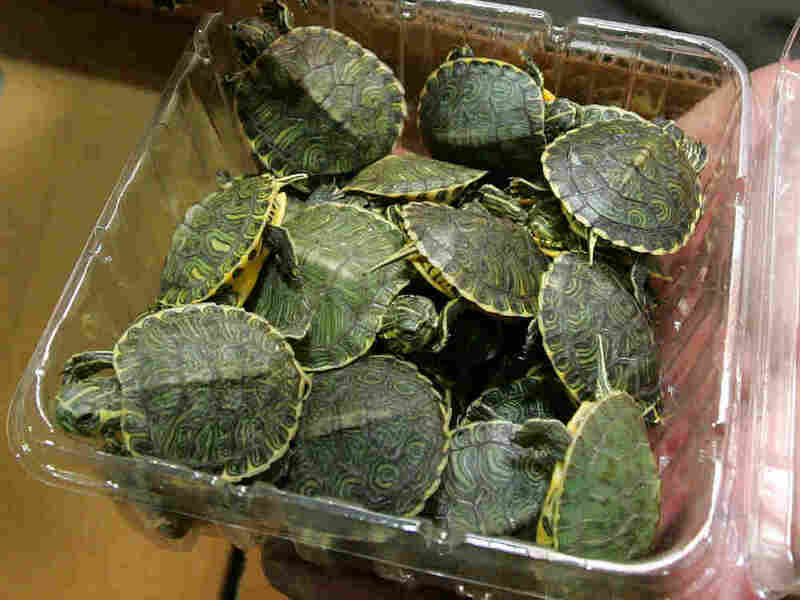 Little pet turtles, like these being inspected at an Atlanta airport in 2006, pose a big salmonella risk--especially for kids. Now our low opinion is bolstered by an in-depth report on a 34-state outbreak of salmonella infections linked to those slimy little reptiles back in 2007 and 2008. Researchers talked with 78 patients or their parents to find out more about the role of turtles in the spread of the dangerous infections. Not a pretty picture. Most of the folks who got sick--60 percent--were around turtles the week before they fell ill. Sixteen, or 34 percent, said the turtles came from a pet store. The original investigation got rolling when two girls got sick after swimming with pet turtles in a backyard pool. Nobody died but 107 people's salmonella illnesses were traced to turtles. Many of the kids ended up in the hospital. The latest report appears in the journal Pediatrics. That sort of thing isn't supposed to happen. Since 1975, the Food and Drug Administration has banned sales of turtles whose shells are less than four inches long to combat salmonella. But many pet stores continue to sell them. By some estimates 6 percent of salmonella infections result from contact with reptiles, including turtles, and 11 percent for folks younger than 21, even after the ban. The authors of the Pediatrics paper conclude tougher enforcement of sales bans are needed and say recent improvement on that front is encouraging.